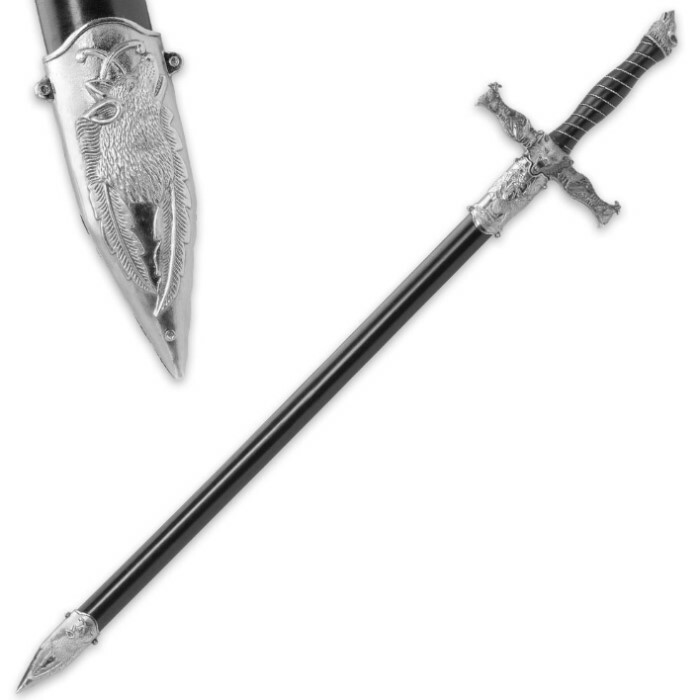 This Wolf fantasy sword is beautifully accented with intricate three dimensional artwork on the guard, pommel and scabbard! Wolves are depicted roaming in packs, howling at night and charging with a snarl. All of the Wolf artwork and sword fittings are cast metal. Other features include the double edged stainless steel blade, wire wrapped handle and hardwood scabbard with black finish. 24 in. blade, 33 in. overall. It was so good I wish it was bigger! It looks and feels good in the hand. Workmanship is what I hoped for. This will make a great addition to a growing collection. This sword did disappoint me with the size but it slowly grew on me and it is a perfect weapon for my midevil costume. I do wish it had an edge for actual swordplay practice but overall i love it! 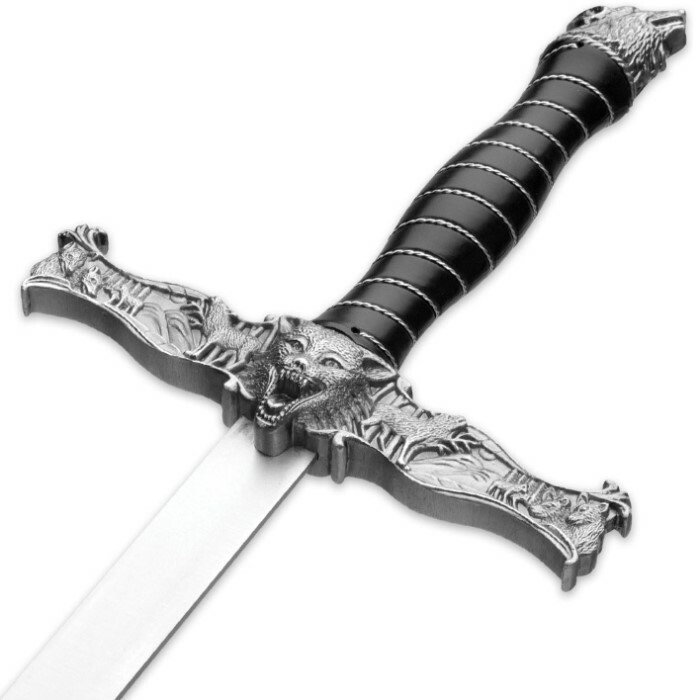 I ordered this sword cause i wanted a cool wolf sword. But i didnt think it would be so small but i got over it, its still a cool sword to add to my sword collection. 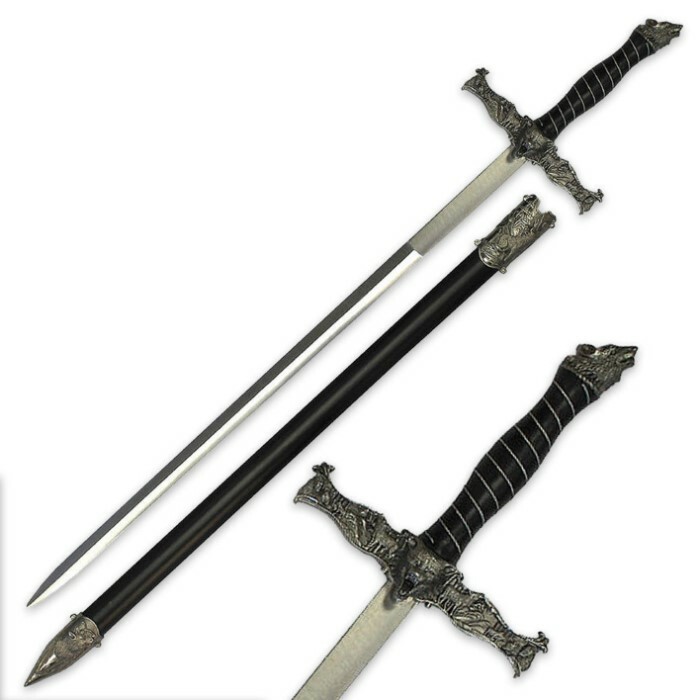 I bought this sword for my sisters birthday and I am over all pleased with this sword. The blade was straight and the hilt and pommel were nicer mettle than I had anticipated. The scabbard was nice and tight around the blade and i could hold it upside down and it was still secure. The only things I don't like are the facts that the screws in the mouth of the sheath are clearly visible, and also the blade only comes "sharpened" up to 18 inches. The last 6 inches are not "sharpened" but have a thick edge to allow the scabbard to grip the blade. For $25 this is a good buy and I would recommend it to anyone who is looking for a good display piece. On a side note, the balance is horrible. Good thing I bought this for dÃ©cor only. I found that the sword was really well made. The only problem i saw was that the blade was bent a little, but would gladly recommend this to anyone who is looking for a sword to add to your collection.